Working from home can be the perfect fit for introverted professionals. Since introverts tend to recharge best by being alone, and focus best while working solo, telecommuting offers them the best possible work environment for their preferences and abilities. Then there are the extroverts. Being extroverted means that you recharge best by being social, and you often do your best work when you can bounce ideas off other people. Working from home could potentially make an extrovert lonely, bored, and likely to lie in wait for the postal worker just to have someone to talk to. But it doesn’t have to be this way. Extroverts can happily work from home without cornering door-to-door solicitors to chat. 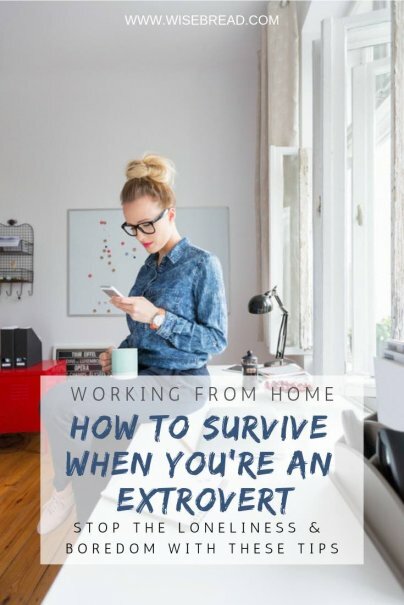 Here are some easy ways you can make working from home work as an extrovert. While one of the big benefits of working from home is the ability to stay in your pajamas all day, it is actually much better for your mental health and productivity to get dressed — and even to look professional. That’s because wearing professional attire helps put you into the right mindset to work, rather than nap, and it also helps to create a boundary between your work life and your home life. A great way to scratch the social interaction itch is to plan on working outside of your house at least once or twice a week. This could mean setting up shop at your favorite local coffee house, or even finding a local co-working space to haunt. Having flexible work hours means you have more options for getting your exercise in every day. Joining a group fitness class will give you both the important social outlet that you crave and the opportunity to step away from the computer for an hour each day to break a sweat. Having regular plans to meet friends in the evening can be a lifesaver for extroverts working from home. This will help you define the end of your work day — which can sometimes be tough for remote workers — and give you a truly re-energizing social outlet to look forward to all day. Most work-from-home jobs require some sort of regular phone calls, group video meetings, or other interactions. If you can, make sure you spread out your work calls so that you have at least one per day, rather than let them all pile up into one particular day of the week. If the timing of your interactions with co-workers, colleagues, or clients is outside of your control, schedule other types of daily interactions to make sure you're getting the conversations you crave. For instance, you could schedule calls to talk to family members or friends on the days when you have no work calls to make. Just a 10-minute chat can make a huge difference in your sense of well-being. Mastermind groups bring together peers who work in the same field to network, bounce ideas off each other, and help encourage each other to move forward in their careers. Having a mastermind group meeting to look forward to once a month (or more often) can be a major boon for the work-from-home extrovert, as it not only provides you with the opportunity to talk shop with other professionals in your field, but it can help you grow your career. Going to industry conferences can be a big win-win for extroverts who work from home, since the go-go-go pace of conferences can fit very well with their personalities. It also provides them with the opportunity for advancement when they bring home new information, clients, sales, or skills. As another plus, you can potentially impress your boss with your initiative by seeking out conferences that could help you do your job better or help your company fulfill its mission. Working from home without losing your mind is more of a challenge for extroverts. But making deliberate choices about everything from what you wear, to how you schedule your time, to where you get your remote work done can help you get the social interactions you crave while enjoying the benefits of working from home.